This morning Alberto Elizondo, Chapel Love III, John Wall and Claudia Cruz were promoted to Sergeant of Police and Alfonso Giraldo, Sr. was promoted to Lieutenant of Police. 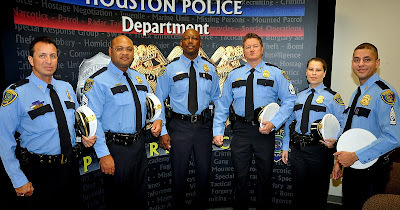 Everyone here at HPD and Recruiting congratulates you and wishes you the best in your new assignments. WOW!!! We are in good hands. My old cubical neighbor John Wall, and my classmate Claudia Cruz Promoted! That's quite a group. Congrats!!!! way to go gauys and gals!